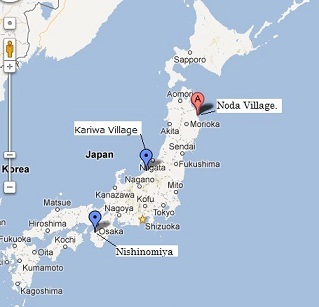 Though it was a short period from May 30th till June 2nd, I visited Noda Village under the support of NVNAD. I had been informed of the situation of Noda Village through lectures but this was my first visit. It was so far from Kyoto to Noda Village that it took me 9 hours by Shinkansen (the bullet train) and bus. Most of the houses near the sea had been washed away by the tsunami and only their foundations reminded me of what used to be there. The tsunami also wiped away the pine forest that had been spreading out there, except for only a few pine trees. Moreover some of them were dying because they had been covered with seawater. I also found a shrine which stood far from the sea, but the pillars of its torii (the gate to a Shinto shrine) had been damaged by the debris the tsunami carried. These and other scars left by the Great East Japan Earthquake and Tsunami of two years ago were still visible. In spite of the devastated scene, at night I saw a clear star-lit sky, undisturbed by city lights, and I could hear frogs croaking here and there. The atmosphere was very serene. On the second day, I took part in the first session of the Study Group on Community Care in the fiscal year 2013 with members of the Noda Village Social Welfare Council. This study group has met several times. Its aim is to enhance practical viability of disaster recovery and restoration by exchanging information about the expected problems and discussing how to deal with them. In view of the fact that residents would increasingly move from the temporary housing to public housing, the main topics of this session included: when these relocations would be carried out, what needs would arise in the process, and how to provide support to fulfill those needs. Two years on, many residents are still living in temporary housing. At Noda Village a new housing complex on higher land is scheduled to be completed in 2015. Given that people will also start moving into public housing in full scale this year, many scenarios need to be considered. In the case of a move, people will need to pack, transport, unpack and clean. As the degree of each household’s need for assistance will be different, it was recognized that it will be very important to grasp the needs of each household through the activities of the Community Care. However, the problem of a manpower shortage to help with the moves was raised. The members of the Social Welfare Council alone are not enough, so the group must consider how to involve volunteers and local high school students for additional support. I also heard a story like this. Some families chose not to live in the temporary housing and instead temporarily rented private apartment houses because they were concerned that their small children might be noisy and bother the neighbors. These families would like to move from the private apartment to the new housing complex on higher land but apparently the current system would not allow this. As a whole, the prospect of relocation to higher land has acquired a definite outlook, but the village residents still have to live in the temporary housing units for a while. Flexible measures for the relocation should be taken to accommodate differences in individual circumstances. Though some challenges are expected, I think the moves will also provide an opportunity for the supporters and residents to get to know each other better. I hope to exchange information with others through the study group sessions and actively help with the moves. This time all I could do was to grasp the current situation and challenges because I had never joined the study session before. From next time on, I would like to go ahead and take proactive measures to engage in the discussions. The next session is to be held at the end of June and we will share the specific needs of the residents related to their moves. On the third day I took part in a social gathering at Izumisawa temporary housing. This was the 19th event of this kind, and about 15 residents, young and old, men and women, took part in the gathering. I played baseball with children and played a game called “Dobiki” with senior women. I had a very good time. It seems that the social gathering facilitates interaction among the residents across generations. Some problems will supposedly occur, as discussed at the study session, but it appears that a lot of residents live in consideration of one another. I will join the social gathering again. Though this was my short first visit to Noda Village, I was able to learn about many things through talking with the residents and listening to their current situation and challenges. Back in Kyoto, I would like to organize my thoughts and what I have learnt so that when I visit again at the end of June, I can apply them to practice.